Some times it is the little things that crack me up the most. This weekend I spend some time with my friend Ann riding horses. We had a really good time! 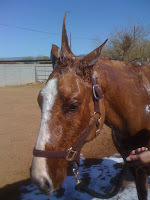 We went out to the state land by her house and rode for a while then came home and bathed & clipped the horses. The photo below is Parker. He was such a good boy during his bath time, he was letting me make him look silly for my own amusement. So of course I couldn't help but post it because it made me think of Alphalfa from the Little Rascals or a Unicorn you can decide which you like better.